In the wake of the attack on Lieut-Gen K S Brar (retd) and the subsequent arrest of more than 15 people in Britain by Scotland Yard’s anti-terrorist squad, attention has again focussed on militant groups based abroad and their Indian connections. Even as the British police has not yet identified the ethnicity of those who have been arrested, everything points towards UK-based militants. The paddy procurement business in Punjab is one peculiar affair in which every party involved is up to some wrong, and yet claims to be the victim. Procurement agency officials, millers and arhtiyas, all have a grudge as well as an axe to grind. This begets the situation of confrontation and boycotts at procurement time every year, which gets predictably resolved — as it happened last week — because none really wants to miss the most lucrative time of the year. Stinking toilets in India are a reality one has to put up with. But, not having toilets at all tells another story. For the urbanites this reality would read like fiction; the fact remains, for about 40 per cent of adolescent girls who go to schools in rural India, their dream of going in for higher education and to join a profession remains only that. The reason: their school does not provide a separate toilet. In a study conducted during the last census it was found that 40 per cent of girls stay away from school in rural and semi-urban areas when they are menstruating. Every month the cycle is repeated and girls find it hard to cope with their schooling. The Audit Reports of the Comptroller and Auditor General of India (CAG) stand automatically remitted to the Public Accounts Committee, popularly known as the PAC, for follow up action after these are tabled in the Parliament. It’s an enigma. Living things die out in a few years after their owners, but lifeless things outlast them many years, even for generations, bringing back a whiff of their memory. Among children, Attention Deficit Hyperactivity Disorder or ADHD is the most common psychiatric disorder. Studies are inconclusive regarding the prevalence of this condition but roughly 3-7 per cent children suffer from it. It would not, therefore, be unusual for one or two children, out of every class of 40, to be found to be struggling with ADHD. This disorder tends to be more prevalent among boys and manifests in boys more in terms of hyperactivity and impulsivity, as compared to problems with inattention in girls. In the wake of the attack on Lieut-Gen K S Brar (retd) and the subsequent arrest of more than 15 people in Britain by Scotland Yard’s anti-terrorist squad, attention has again focussed on militant groups based abroad and their Indian connections. Even as the British police has not yet identified the ethnicity of those who have been arrested, everything points towards UK-based militants. General Brar, who was wounded in the attack, has been a target of militants because of his role in Operation Bluestar. Britain’s foreign office was quick to condemn the attack as “unacceptable and appalling”. Understandably, the immediate focus of the Union Home Ministry is to review the security of Lt-Gen Brar and also of other senior officers who participated in Operation Bluestar. Along with this there are concerns about the role of foreign-based organisations in fomenting trouble in Punjab. There have been some incidents of recovery of weapons and arrest of people with a militant past who had apparently escaped the long hand of the law for decades. The latest incident, while exposing chinks in the security cover of General Brar, has also shown the failure of the Indian diplomatic effort in keeping foreign governments informed about militants who have a vested interest in raking up old issues and interfering in the internal affairs of India. Militancy is history in Punjab, but to ensure that it remains so the government must remain vigilant. Any attempt by foreign elements, whether in the diaspora or otherwise, to foment trouble must be dealt with urgently. The Indian diplomatic missions and the Ministry of Home Affairs need to work together with foreign agencies to ensure that information about terrorist activities is exchanged forthwith and acted upon promptly. Terrorists are international pariahs today and must remain so. Governments worldwide need to act together in cracking down on any possible terrorist activity, be it domestic or international. The paddy procurement business in Punjab is one peculiar affair in which every party involved is up to some wrong, and yet claims to be the victim. Procurement agency officials, millers and arhtiyas, all have a grudge as well as an axe to grind. This begets the situation of confrontation and boycotts at procurement time every year, which gets predictably resolved — as it happened last week — because none really wants to miss the most lucrative time of the year. There are hundreds of cases against officials handling food grains and also CBI inquiries against rice mill owners. Even as they would like to say they are being targeted for others’ faults, the fact is lakhs of tonnes of paddy goes missing each year. The wrongdoers take advantage of the complexity of the procurement, payment, milling and stock clearance process, which makes it hard to fix responsibility. Arthiyas buy paddy from farmers on behalf of state procurement agencies, which in turn are doing it for the FCI. The payment to the farmer comes back through the same route. Stocking of the procured paddy — supposed to be done by the food agencies, which do not have the infrastructure required — is done by millers on their behalf. In between all of this, when paddy or payments go missing, it becomes hard to trace the stock, and identify the culprit. While it may be unscrupulous individuals exploiting the system, it is wrong or outdated policies of both state and Central governments and inadequate infrastructure that allow for the situation to prevail. The millers are paid an unrealistically low price for milling, thus making embezzlement the primary reason to remain in business. Ultimately, though, they end up making more than the ‘due share’. The stock holding ability of the government agencies is far less than required, which creates a situation of wastage and mismanagement that make it convenient for officials to write off stock that is actually stolen. The arhtiyas exploit their hold over the payments to be made to the farmer. In the end, it is the only the farmer and the nation that suffer. Would it be wrong to suspect there is a vested interest in not correcting the system? They stop going to school during the days of menstruation or drop out because school toilets do not offer them required privacy to take care of their sanitation needs. Our architects of lofty education plans like the Right To Education( RTE) Act have been overlooking this basic infrastructural requirement in education for over 65 years, which has kept 40 per cent of our 243 million adolescents out of the education system for no fault of theirs. A report by UNICEF has also found that in government schools in India, where separate toilet facilities are made available, attendance has gone up, especially that of girls, by as much as 14 per cent. An NGO Child Rights and You( CRY) has found that only 44 per cent schools covered under the RTE Act have separate, functioning girls’ toilets. According to the National Family Health Survey data, only 20 per cent of schools in Chhattisgarh, Jammu and Kashmir and Madhya Pradesh have the facility of separate toilet while in north-eastern states, including Assam, only 27 per cent of schools have the facility. If only proper school infrastructure is provided, 43 per cent girls who get married before the age of 18, and 13 per cent of whom become teenaged mothers, could realise some other dreams too. The PAC calls for background information from Government departments, examines records and takes evidence of witnesses and presents its findings to both Houses of Parliament. Government departments are required to send their response to the observations and recommendations to the PAC within six months and the PAC may present a fresh report to Parliament, called the Action Taken Report, with reference to the response of departments. However, because of what may be described as a system overload in consequence of the large number of Audit Reports every year, the PAC follows the aforesaid detailed procedure of examination of witnesses only in a limited number of cases and in other cases, the final action rests with the Action Taken Notes which the departments are required to submit to the PAC within four months of the presentation of the Audit Report to Parliament. According to the Annual Financial Committees Reviews for the years 2010-11 and 2011-12 recently placed on Parliament’s website, the PAC and its sub Committees held 49 sittings during 2010-11 and 27 sittings during 2011-12 The PAC presented seven original reports and six Action Taken Reports during 2010-11 and 15 original reports and 10 Action Taken Reports during 2011-12. Nearly 80 per cent of the recommendations were accepted by the Government during the two years; this is indicative of the collective sagacity of the PAC even as there might be concerns regarding the actual implementation of the recommendations. A welcome innovative practice adopted by the PAC in recent years is the regular review of the pending Action Taken Notes which had not been submitted by the departments. Additionally, the PAC takes up one or two cases for a detailed examination out of those which had initially been left for closure by submission of Action Taken Notes. This is expected to promote greater earnestness on the part of the departments in taking follow-up action on cases that are not examined in detail by the PAC and run the risk of languishing till they die a natural death. The PAC spent 17 out of the total number of 34 sittings of the main Committee during 2010-11 on what has come to be popularly known as the 2G Spectrum case, four of these even before the presentation of the Audit Report in the Parliament. The PAC took evidence of not merely serving and retired Government officers but also of the private parties like service providers, media persons and a corporate lobbyist. The PAC had invited witnesses through a press advertisement. During 2011-12, the PAC took oral evidence of a retired officer of the CAG’s organisation on the latter’s reported differences of opinion with the CAG on calculation of presumptive loss in the allocation of 2G Spectrum. In this connection the practice so far had been in accordance with the following position stated by the first CAG of independent India, V Narhari Rao, before the PAC in May 1951: “For all that is included in the Audit Report, including opinions, the ultimate responsibility is that of the Auditor General, who countersigns the report, but he holds the Accountant General responsible to himself”. According to media reports, the PAC report on the case to Parliament is held up because of lack of unanimity amongst the members which is a must under the rules. There are serious issues of accountability and governance involved, including the relationship between the Minister and the Secretary (who was rather peremptorily over- ruled by the Minister) as well as the role and the accountability of the regulatory authorities. Given the highly fractured nature of the polity, time has perhaps come to revisit the rules to permit minutes of dissent, with appropriate safeguards, so that the PAC report is not held hostage to an elusive unanimity. Earlier in 2003, on the Audit Report on Procurement for Operation Vijay (Kargil war related defence purchases which included comments relating to the purchase of aluminum caskets-i.e. coffins) the PAC held a number of sittings during 2001-02 and 2002-03 and also took evidence of the witnesses but eventually presented what may be called a ‘non-report’ to Parliament, stating that it was not in a position to give its findings since the Government had not agreed to make available certain secret documents. The Government had declined to supply the documents on the ground that this would be prejudicial to the interest of the State as per the rules but also offered to show the documents to the Chairman in the chamber of the Speaker. The ultimate loss was that of public accountability. The PAC has carried forward the Audit Report on Performance of Civil Aviation in India to 2013-13 after taking evidence of the representatives of Air India as well as the various staff associations during 2011-12. In the mean time on a PIL the High Court of Delhi has expressed the hope that the PAC will examine whether the matter needs to be probed by the CBI/SIT if there is prima facie case of imprudence, gross negligence, hinting towards clear mala fide, violations of the settled procedure in taking the decision etc. This has raised the bar for the report of the PAC which will be keenly awaited. India is one of the select group of countries that put out an annual review of the activities of the PAC. The review can be enriched by including additional information on the number of cases in respect of which the Government has not submitted the Action Taken Notes, the number of cases in which the Government response to the recommendations of the PAC has not been received and the details of cases in which the Government has not accepted the recommendations of the PAC. The PAC reports are not normally discussed in Parliament. A discussion in both Houses based on the annual review amplified on the lines suggested without the matter being put to vote will bring to bear the collective weight of Parliament on the work of the PAC and thereby strengthen the legislature’s financial supremacy over the executive and public accountability. Our Labrador, Winston, who was fed lovingly by my wife, Savitri, (a spiritual guru had instructed her to feed a black dog daily) survived her for a couple of years; the plants she had collected in our flat’s balcony, the bonsai pipal, the araucaria etc. lived on for a few years more and then died out one after another. The sole exception is the banana plant she used to water religiously after her morning puja; it has adjusted to my agnostic care and has miraculously lived on, shooting suckers. But the lifeless things she had collected live on even after a decade of her passing away. Take the bed covers. She was a collector of sorts when it came to bed covers. After about eight months of her demise, when I opened the built-in box in one of the beds for woolens, I discovered them. They were all special, not meant for our daily use – some in heavy brocade with frills, others in satin in soft dreamy colours with cream white lining, and many in attractive handloom designs, all strikingly beautiful. There were bed sheets too with matching pillow covers – snow-white cotton sheets with stunning needle work showing life-size parrots in parrot green silk thread or multi-coloured flower motifs and patterns, all painstakingly hand-stitched. It was a treasure trove. I gave some to our daughters but many still remain in my use, her memory lingering in their folds. The flat we had moved in after my retirement, which she had tastefully furnished, obviously lives on, carrying bold imprints of her memory. No wonder kings of yore depended on forts and castles to perpetuate their memory. Her memory is inextricably interwoven in the beds, the sofa set, mats and carpets, the glass top dining table, et al. Even a little hand-made moodha, or rather moodhi, she had bought for Jyotsana’s daughter, Gungun, when this two-year-old wonder lived with us while Jyotsana was posted in Delhi and her husband in Bonn, has stayed in the flat lying in the same corner of the room, bringing both Gungun and her Nani to my mind. Her spectacles remain. She wasn’t much of a reader but everyday, without fail, she used to write ‘Shri Rama’ (in Hindi alphabet) in a page or two in a notebook wearing the spectacles. These notebooks remain – they are our most prized possession. My book, Before He was God – RAMAYANA, carries its facsimile as a frontispiece. The photographs remain of course, some taken by me — against the backdrop of Taj Mahal holding little Upasana in her lap, trudging the snow-clad slopes of the Amarnath cave, walking in front of the Kali temple in Kolkata, etc. She was averse to being shot generally, almost hostile, but permitted me to shoot her on those special occasions. The Buddha’s tooth, the shroud of Jesus Christ, the Prophet’s hair and Gandhi’s old-fashioned spectacles enchant mankind to no end. It struck me one doesn’t have to leave a legacy for remembrance; the gentle doves of memory take flight at seeing even the most mundane, little inanimate things that remain behind. These thoughts came flooding in my mind on her approaching birth anniversary. For ADHD to be diagnosed, the symptoms must appear before the age of 7. While signs of ADHD can often begin during infancy, it is when the child is put into a structured environment such as preschool or playschool that these symptoms are usually recognised. While these symptoms remit in some patients as they enter adolescence, ADHD is known to persist into adulthood for almost half the patients. Aryan (name changed) was 5 years old and studying in class 1 when he was referred to a psychiatry clinic. His parents brought him after repeated complaints from his teacher - Aryan never paid any attention to what was taught in class, didn't complete his work, often forgot his books at home, didn't sit still and disrupted the classroom. On two occasions, he had hit his classmates. Even at home, he couldn't study longer than 5 minutes and every little sound distracted him. Yet, he could play videogames for hours on end. On evaluation, his IQ was found to be 115, and there were no learning deficits. Aryan underwent behaviour therapy with a child psychologist, wherein his ability to sustain his attention for longer durations was fostered. He was taught techniques to control his impulses and an activity schedule comprising of frequent breaks and rigorous physical activity was implemented. Aryan is now 20 years old and in college and studying to be a lawyer. He still feels restless and agitated, but is able to concentrate on his work and has a close circle of friends. The distinguishing features of ADHD are lack of attention, hyperactivity and impulsivity. 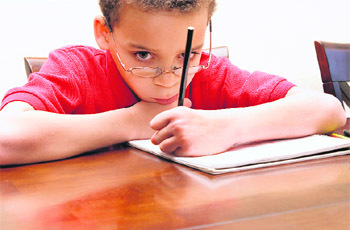 Due to deficit in attention, children with ADHD are prone to making silly mistakes in schoolwork, avoid long tasks, have difficulty in organising their activities, lose things like pencils, books and toys, get easily carried away by the smallest of distractions, seem to be daydreaming and appear to be forgetful. Even when talking directly to a child with ADHD, it wouldn't be unusual for you to feel that you weren't being listened to. But more than inattention, it is hyperactivity that brings children with ADHD to the notice of parents and teachers. Such children seem to constantly be on the go, as if driven by a motor. They may talk excessively, fidget, and find it difficult to remain seated in classrooms and movie halls. This hyperactivity gets coupled with impulsive behaviour wherein children have difficulty in waiting for their turn, often blurt out answers before questions have been completed and interrupt conversations. These symptoms don't present themselves identically in every patient with ADHD. Each of these prominent features are present in different degrees among these children. ADHD is not something that is in control of the child. Rather, ADHD is a neurobiological condition. While the exact cause behind ADHD remains unknown, imaging techniques have revealed differences in the structure and brain activity of people with ADHD. ADHD is known to have a genetic component, that is, it tends to run in families. Some studies have also suggested a link between maternal smoking during pregnancy and ADHD in children. Children with ADHD live by what some theorists have called the “four-second rule”. If you wanted to predict or understand the behaviour of a child with ADHD, imagine that the world was to end in the next four seconds: How would you spend those last few moments? Would you spend it doing your homework? Would you rather get into trouble or escape by telling a simple lie? Children with ADHD live in the present. Hindsight and foresight are not what these kids rely on. Children with ADHD have no deficit when it comes to intelligence. Their IQ is at par with those without ADHD. Yet, they grapple with academic failure. They find it difficult to sit at one place and study for long durations, and get easily distracted by the slightest stimulation in their environment. Aside from concentration difficulties while preparing, a child with ADHD might just lose interest in writing a test after the first two to three questions, despite knowing all the answers. Their hyperactivity causes disruption in the classroom. Their inability to control their impulses may lead to difficulties amongst peers. In fact, 75 per cent children with ADHD exhibit aggressive and defiant behaviour regularly. Such children constantly get into trouble with authority figures, receive negative criticism and face ridicule from their teachers. Peers ostracise them and they are often the target of adverse and hostile comments. The home environment is fraught with stress and frustration. It is for these reasons, and more, than ADHD is often accompanied by tremendous emotional distress. It is not unusual for these children to grow up with low self-esteem and a negative self-concept. The incidence of school drop-outs is much higher in children with ADHD. Children with ADHD, buy the sheer nature of their impairment, are more prone to accidents. They tend to cope with difficult situations by acting aggressively. These children are more likely to develop conduct problems and get embroiled in fights. What is particularly worrying is that about 30 per cent of children with ADHD, who go untreated, are likely to end up indulging in substance abuse. When it comes to the family, ADHD is synonymous with chaos. Preparing the child for school is a battle that must be waged every morning. Getting the child’s homework done seems to become the parent’s own homework. Parents of such children may not only have to deal with the emotional baggage their child comes with, but also face ridicule at the hands of teachers. Such children require their parents to invest greater time and effort to help them out in their studies; siblings may perceive themselves as feeling left out, or neglected. The stress of coping with their child’s day-to-day difficulties may contribute to haggard nerves and increasing conflicts between family members. Yet, it is ironic that an adverse, stressful family atmosphere only weakens the prognosis of children with ADHD. A stressed out parent then, can be extremely detrimental to the child’s wellbeing, even if the child is the reason that the parent is stressed out in the first place. No specific laboratory measures can test conclusively for ADHD. It is a neurological condition, but tests can only reveal non-specific abnormal results in hyperactive children. What is required is to conduct cognitive tests and tests of neuro-psychological functioning, to assess the child's ability to attend and concentrate on tasks at hand. At the same time, certain behavioural checklists can be used to assess the child's behaviour for signs and symptoms of ADHD. The disorder must manifest itself in at least two different situations. Therefore, it is important for such checklists to be corroborated by teachers and parents alike. Diagnosing ADHD can be challenging. ADHD is not the only reason children might have difficulties concentrating or display defiant behaviour. Symptoms of anxiety can at times mirror the restlessness and prone to getting distracted seen in ADHD. Mania and ADHD also share some core features - excessive talking, hyperactivity, irritability and distractibility. ADHD can only be dealt with effectively if one is aware that it is a neurological condition — not something the child is doing deliberately or something the child has control over. There is no ‘cure’ for ADHD, but its symptoms can be managed to minimise disruption. In some, not all, cases, medicines can be used to manage the impulsive behaviour and hyperactivity in children, to help them adjust better to situations. What is more crucial for the management of ADHD is psychosocial intervention. First and foremost is the need to ‘psycho-educate’ the parents. Parents need to know that even though their child is not voluntarily exhibiting symptoms of ADHD, hope is not lost; their child is still capable of meeting reasonable social and academic expectations, and can, in fact, achieve great success as well. Parents need to be attuned to the child's development needs to build a comprehensive self-concept and a sense of mastery over their environment. Behavioural interventions are most effective in the management of ADHD. Behaviour modification with the use of consistent reinforcements, attention-building activities and activity scheduling can yield great benefits. For this to be successful, however, requires the joint effort of therapists, schoolteachers and parents, alike. Teachers need to be sensitive to the specific requirements of such students — frequent breaks, repetitions and short, multi-sensory inputs are more effective. It's important to realise that their behaviours are not intentional and that they are already grappling with a fragile self-concept. They must, therefore, not be reprimanded in front of the entire classroom. Behavioural therapy aside, the emotional distress of the child must never be neglected. The experience of ADHD can be a difficult one and the child needs a non-judgmental outlet to be able to express their feelings. Along with behaviour therapy, social-skills training is important to enable the child to form sustainable peer relationships and to enhance the acceptability and self- esteem of the child. Interventions with children with ADHD are not easy; they may take up to many months and years of painstaking work before yielding any consistent results. Nonetheless, ADHD can be managed, and with the right intervention, these children can grow up to find success and happiness.